Generous giving can be a sign of how the economy is doing, and if the auction of the custom SR-71 Blackbird Mustang at the EAA AirVenture show yesterday is anything to go by, then things are looking up. 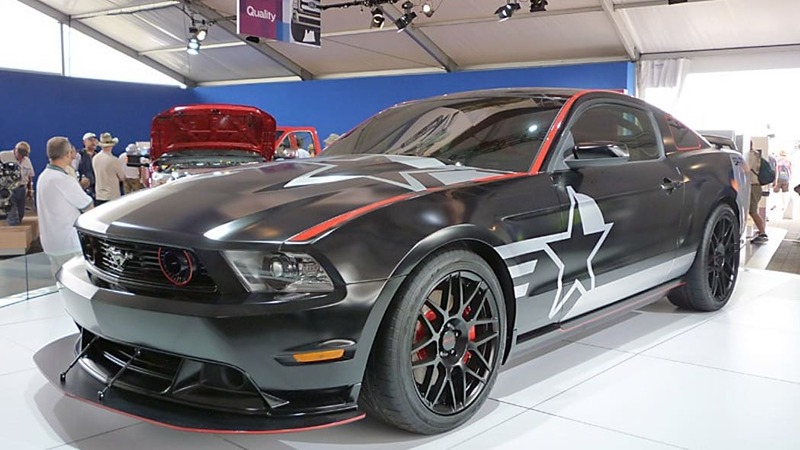 Built in collaboration with Ford, Roush and Shelby, the one-off pony car was sold for $375,000 to benefit the EAA's Young Eagles program – that's significantly more than $250,000 the AV-X10 'Dearborn Doll' Mustang raised last year at the event. Of course, the winning bidder was likely motivated by a little more than charity during the bidding. 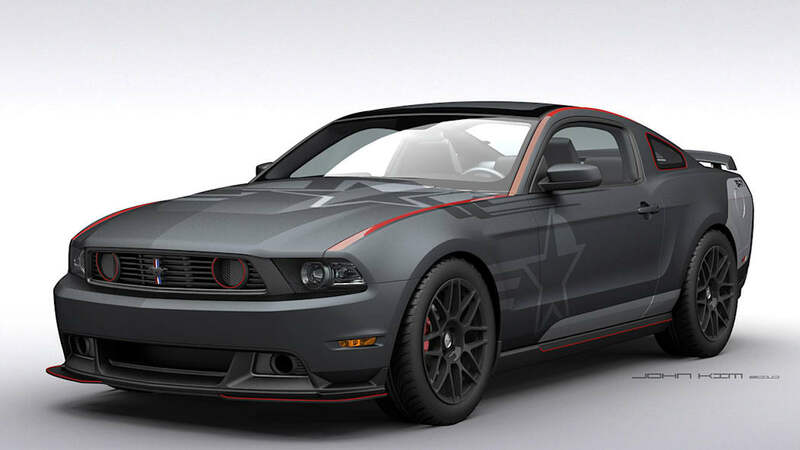 The one-of-one 2011 Mustang features an exterior designed after the legendary Lockheed SR-71 Blackbird reconnaissance plane, and it includes black and gray matte exterior paint, custom front and rear fascias, performance wheels and a unique screen-print glass roof. Performance has also been boosted thanks to a Whipple supercharger system and a slew of Ford Racing Performance Parts. Follow the jump for more details on the car or check it out in our gallery below. 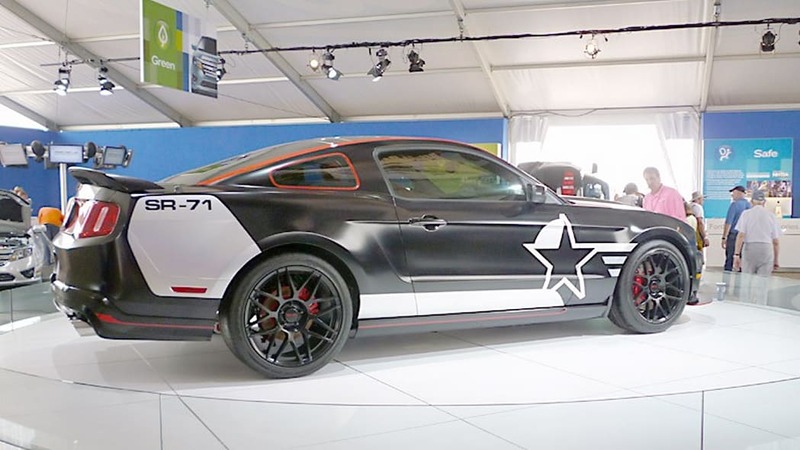 Two automotive icons, legendary racer and manufacturer Carroll Shelby, and world-renowned racer, engineer and designer Jack Roush, have come together in their first vehicle collaboration project to join Ford in creating a one-off 2011 Mustang, the aviation-themed SR-71 "Blackbird." The one-of-a-kind vehicle will be sold at the Gathering of Eagles July 29 during the Experimental Aircraft Association (EAA) 2010 AirVenture Oshkosh, the world's greatest aviation celebration. Ford is the exclusive automotive partner of EAA AirVenture Oshkosh and all of the proceeds from the sale will benefit the EAA Young Eagles organization. EAA AirVenture Oshkosh will be held from July 26 to Aug. 1 at Wittman Regional Airport in Oshkosh, Wis. 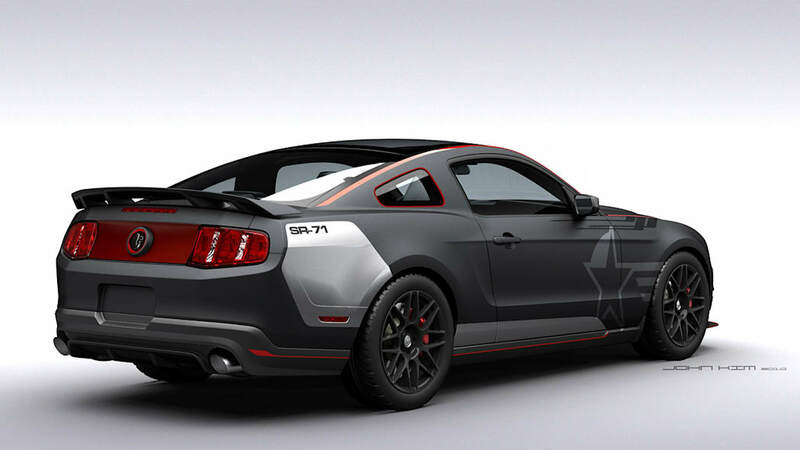 The "SR-71" designation holds a dual meaning for the one-of-a-kind, fully-customized Mustang. First, "SR-71" refers to the car's design and performance-inspired connection with the SR-71 Blackbird, the aircraft that holds all official airspeed and altitude records and is widely regarded as one of the most spectacular planes ever produced. Second, "SR" represents the first collaborative project between Shelby and Roush. Mustang Chief Designer Darrell Behmer led design for the project and Mustang Chief Nameplate Engineer Dave Pericak led the engineering effort. Ford Racing Performance Parts were also added to further enhance the exclusivity of the car. The sale of the SR-71 "Blackbird" will highlight an evening of festivities at the EAA Gathering of Eagles July 29 during AirVenture. The group that will directly benefit from the auction proceeds is EAA's Young Eagles, which has provided free introductory flights to more than 1.5 million young people since 1992, while also teaching the value of hard work, personal responsibility and enhanced math and science skills. "Ford Motor Company's historic tie to aviation is no better represented than by the company's commitment as a continued partner of EAA and AirVenture, a celebration of flight here in Oshkosh that is unmatched anywhere else in the world," said Tom Poberezny, EAA chairman and president. "Ford's generosity in donating the Mustang SR-71 'Blackbird' to the Gathering of Eagles further demonstrates a dedication to supporting aviation and inspiring aviation enthusiasts of all ages." In 2008, Ford's inaugural vehicle specially-built in support of the Young Eagles, the one-of-a-kind Mustang AV8R, raised a record $500,000 for the charity. "The excitement around the 2008 AV8R, our first one-off Mustang ever produced, inspired us to push for another, first, the collaboration of Carroll Shelby and Jack Roush," said Edsel B Ford II, a member of Ford's Board of Directors. "This year's SR-71 Blackbird is a special tribute to Ford's lineage of performance vehicles, as well as to the promising innovators of EAA's Young Eagles." Ford vehicles sold at auction during past EAA AirVenture events have collectively raised more than $1 million to support the Young Eagles. The Mustang SR-71 "Blackbird" is Build #1 of 1 and presents a truly unique opportunity for collectors. 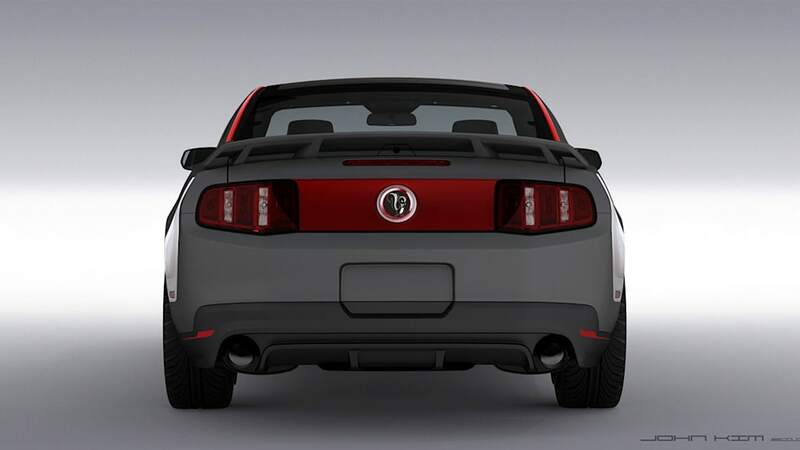 The vehicle is based on a 2011 Mustang GT 5.0 with the glass roof option. Ford Racing performance modifications (Supercharger, Handling Pack, tuned exhaust, and exhaust tips) generate 100 additional horsepower from the all-aluminum 5.0L 32-valve V8 engine. The special racing Handling Pack optimizes the performance experience and lowers the ride height by 1-inch. From there, the car takes on a design personality similar to that of the original SR-71 Blackbird aircraft. The Mustang's stunning design theme includes black and gray matte exterior paint with harmonious SR-71 themed graphic treatment, performance wheels, front and rear fascias and an integrated spoiler/wing to reflect the car's connection with its namesake aircraft, which made its inaugural flight in 1964, the year the first Ford Mustang came off the line. The "Blackbird" nickname is reflected in the car's exterior paint treatment, complete with markings from the liquids which leaked and streaked until the plane came up to speed. 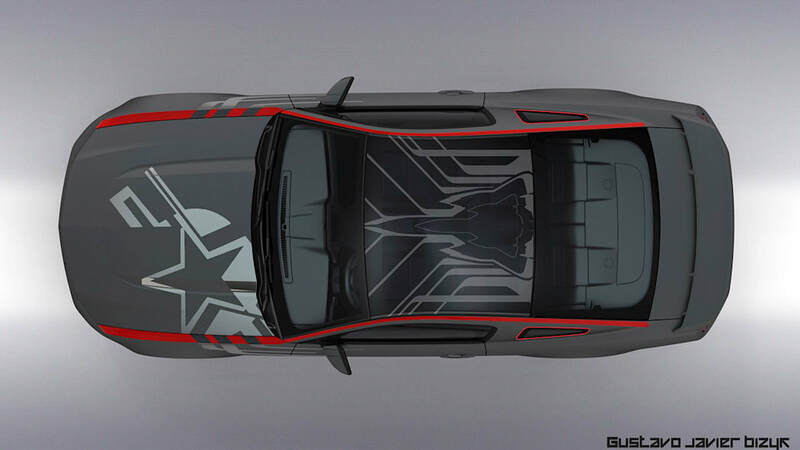 A unique screen print glass roof design and exterior artwork reflect the unbridled spirit of the Ford Design team. The interior cockpit will seat only two and includes a roll-cage, racing seats and fire extinguisher, The signatures of Jack Roush and Carroll Shelby are embroidered into the seats, and special gauges and instrument cluster graphics have been added. 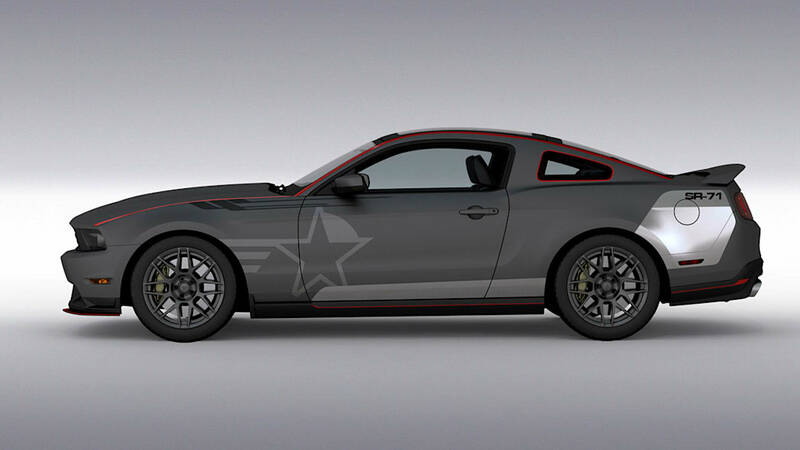 Enhancing the value and allure of the vehicle, the Mustang SR-71 "Blackbird" will feature an appliqué autograph area capturing Roush and Shelby's signatures and badging to further reinforce the uniqueness of the car. The vehicle will be on display at the Ford Hangar at EAA AirVenture Oshkosh beginning July 26. Additionally, Ford and EAA will give AirVenture attendees the chance to win a 2011 Mustang GT convertible and other cash prizes in a raffle, with proceeds benefiting the EAA Young Eagles program. During EAA AirVenture, Ford also will offer attendees access to the latest advances in automobile technology, as well as many of the industry's most revered classics at the popular "Ford Hangar" on the grounds of Wittman Regional Airport in Oshkosh. Ford activities will include top-tier entertainment and interactive components that will add excitement for the hundreds thousands of aviation fans in attendance. The annual meeting of the Experimental Aircraft Association (EAA), EAA AirVenture features more than 2,500 show aircraft, including homebuilts, antiques, classics, warbirds, ultralights and rotorcraft, and is expected to attract nearly 600,000 aviation enthusiasts. During the week, more than 500 forums are conducted by aviation leaders and NASA researchers, along with FAA personnel, aircraft designers and a host of others. EAA AirVenture is a 24-hour event. For more information, please visit www.AirVenture.org. Ford Motor Company, a global automotive industry leader based in Dearborn, Mich., manufactures or distributes automobiles across six continents. With about 176,000 employees and about 80 plants worldwide, the company's automotive brands include Ford, Lincoln and Mercury, production of which has been announced by the company to be ending in the fourth quarter of 2010, and until its sale, Volvo. The company provides financial services through Ford Motor Credit Company. For more information regarding Ford's products, please visit www.ford.com.